Embark on a thrilling and romantic journey as you vacation on one of the most beautiful beaches of the Dominican Republic and rest in the heart of the gorgeous Tortuga Bay Hotel.The only AAA Five Diamond Awarded property in the Dominican Republic, Tortuga Bay offers responsible luxury, impeccable service and villas with interiors designed by the world-famous Oscar de la Renta. Sitated on a private enclave within the resort, this boutique hotel includes 13 luxurious villas offering unrivaled luxury, privacy, security and five-star service. 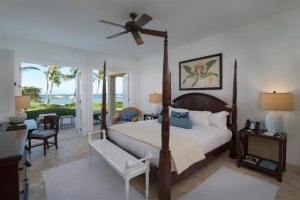 Guests may choose from a variety of accommodations: 1 bedroom junior suites, 2 bedroom suites, 3 or 4 bedroom villas, all situated along pristine white-sand beaches, with the best of services and amenities that luxury can offer. 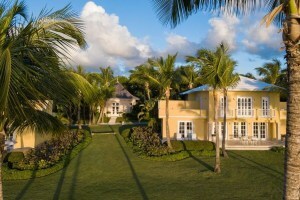 The Tortuga Bay experience extends well beyond unparalleled service. The challenge might be between choosing to go out or staying in. An award winning beachside resort that is flanked by lush green forests on one side and the Caribbean sea on the other. Recipient of AAA Four Diamond Award, the Bamboo Restaurant provides the perfect setup to feast on organically grown vegetables and fruits in a graceful and cozy ambiance. For lunch, try one of the healthy platters that can be enjoyed in Bamboo or while soaking in the sun beside the pool. Also, any time of day, a diverse selection of gourmet coffees and international teas is served. Please inform the chef before hand incase of any dietary restrictions. Enjoy the AAA Three Diamond Award-winning La Yola Restaurant, serving the freshest Mediterranean cuisine and seafood in an elegant setting. Modeled on a fishing boat, La Yola restaurant perches on the sea at the Puntacana Resort & Club Marina, with magnificent views of the sparkling turquoise waters. Please inform the chef beforehand in case of any dietary restrictions. Tortuga Bay Lounge, located poolside, next to Bamboo restaurant, indulges guests with an intimate atmosphere and a variety of Dominican delights including hand rolled cigars, locally sourced appetizers and fine sipping rums. Please inform the chef in case of any dietary restrictions. The resort's swimming pool is the perfect place to relax and spend a quiet evening, with a stunning view of the sea and the beach. the pool also has a restaurant on one side where you can slip into and relish some amazing Mediterranean dishes. Please enter the pool in proper swimming attire. 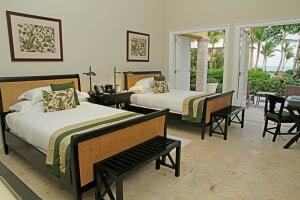 This property offers free VIP service from Punta Cana airport to the resort during arrival and departure. The non-profit wing of the resort, Fundación Grupo Puntacana is proud partners with Pack For A Purpose, an initiative that gives travelers a chance to impact and help the community of their destination. Guests can carry a few stationary items for schools and clinics in need and help the lives of local children and families. Pets are welcome at this resort but extra charges may apply. The maximum number of extra beds permissible in a room is one. All children under two years of age stay free of charge for children's cots/cribs.